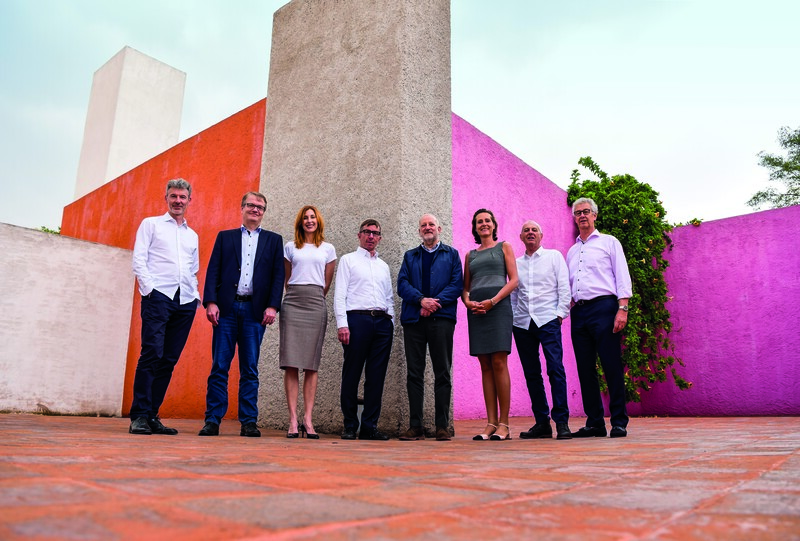 The Board of the LafargeHolcim Foundation photographed at Casa Luis Barragán (l-r): Stuart Smith (United Kingdom); Jens Diebold (Switzerland); Maria Atkinson (Australia); Harry Gugger (Switzerland); Enrique Norten (Mexico); Marilyne Andersen, Marc Angélil, Roland Köhler (all Switzerland). Not pictured are Alejandro Aravena (Chile), Jan Jenisch (Switzerland), and Brinda Somaya (India). The members of the Board of the LafargeHolcim Foundation met in Mexico City so their meeting would coincide with the Awards Lab at IBERO (Universidad Iberoamericana) and the global Awards hand-over in the city. 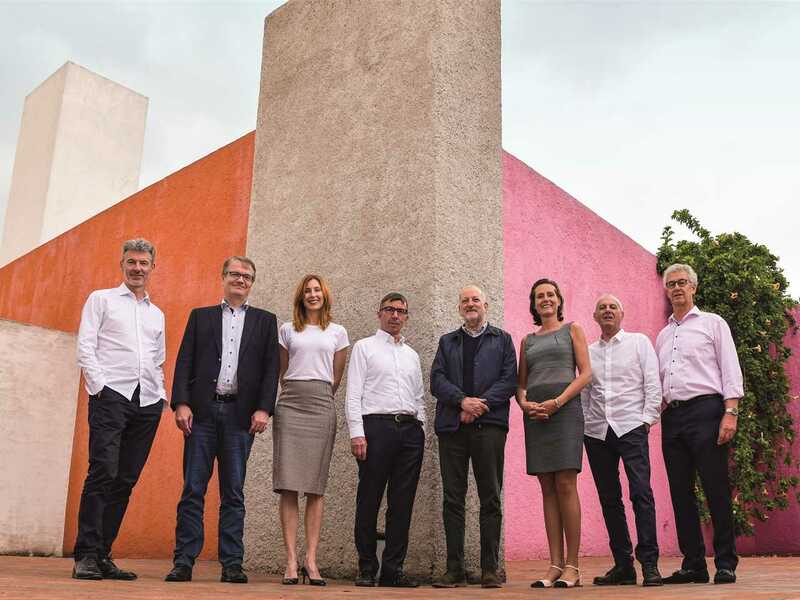 Enrique Norten hosted his fellow Board members and invited them to visit the Luis Barragán House and Studio (Casa Luis Barragán), a UNESCO World Heritage site since 2004. Barragán (1902-1988) was an internationally renowned Mexican architect and engineer. His work influenced contemporary architecture visually and conceptually, and is particularly known for its distinctive scheme of colors that are inspired by Mexican artisanal tradition. The Board was photographed on the enclosed roof garden (l-r): Stuart Smith (United Kingdom); Jens Diebold (Switzerland); Maria Atkinson (Australia); Harry Gugger (Switzerland); Enrique Norten (Mexico); Marilyne Andersen, Marc Angélil, Roland Köhler (all Switzerland). Not pictured are Alejandro Aravena (Chile), Jan Jenisch (Switzerland), and Brinda Somaya (India). Casa Luis Barragán was built in 1948 and represents one of the most internationally transcendent works of contemporary architecture. It is said to be a masterpiece in the development of the modern movement that merges traditional and vernacular elements, as well as diverse philosophical and artistic currents throughout time, into a new synthesis. Luis Barragán’s influence on global architecture continues to grow; and his house, faithfully kept just the way it was when inhabited by its designer, is one of the most visited sites in Mexico City by architects and art connoisseurs from around the world. The museum includes Barragán’s residence and studio, and is property of the Government of the State of Jalisco and the Fundación de Arquitectura Tapatía Luis Barragán.